Background: An ‘Iron Age enclosure’? 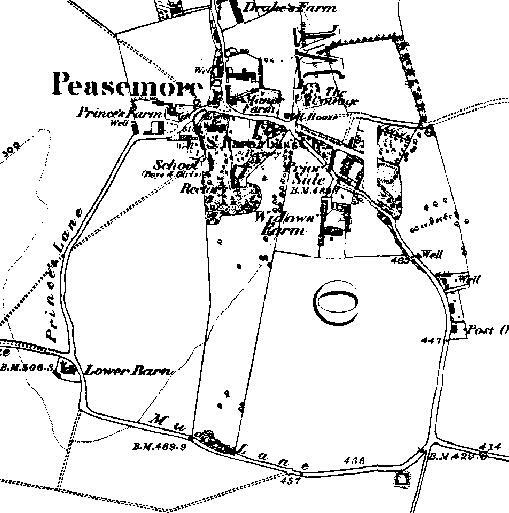 The Peasemore ‘enclosure’ referred to in this paper is an irregular circular area of approximately 28 hectares (70 acres) defined by three lanes – Princes Lane to the west, Mud Lane (formerly Males Lane) to the south and to the east a lane that leads from the centre of Peasemore village to a junction with Mud Lane and the road formerly known as the ‘Wildway’ which leads towards Chieveley (see fig 1). The area of land within the enclosure slopes from higher ground in the north and west to lower ground in the south east, where the enclosure takes in part of the western side of a dry valley. The feature is recorded on the West Berkshire Site and Monuments Record (SMR) as a possible enclosure. The SMR notes that the site has been suggested as a possible Iron Age enclosure by various antiquarians and modern investigators including Don Lindsay, a BARG member and historian of the parish of Peasemore. Don has suggested the site may have been a cattle enclosure. The ‘Iron Age enclosure’ interpretation by antiquarians was based on comparisons with the Iron Age earthworks around Silchester and a site at Lambourn Place. The author is also aware that comparison has been made, based on the ‘polygonal’ shape of the enclosure, with Segsbury Camp hillfort. However these comparisons with other Iron Age sites have their problems, in that the Peasemore enclosure does not directly resemble any of them. Most Iron Age enclosures associated with settlements are very much smaller than the Peasemore enclosure. Similarly, Iron Age hillforts in Berkshire are generally significantly smaller than the Peasemore enclosure, which in any case does not occupy an obviously defensive position. Moreover, the earthworks surrounding the Peasemore enclosure are less substantial than those typically surrounding hillforts or the oppidumat Silchester. BARG has conducted a rudimentary survey of the earthworks at Peasemore via visual inspection from the surrounding lanes (see fig. 2). The surrounding bank on the western and most of the southern sides does not exceed 4 feet (1.2m) and is less than 2 feet (0.6m) for much of these lengths – these earthworks may simply be normal roadside ‘hedgebanks’. On the eastern side and the south eastern corner the banks are more impressive, reaching a maximum height of 9 feet (2.75m) and rarely dipping below 5 feet (1.5m). Such banks would compare in height to the first phase of earthworks at Uffington Castle, but at Peasemore the banks are not accompanied by significant ditches. However before prehistoric comparisons are rejected too hastily on the grounds of enclosure size and earthworks it is worth mentioning a site such as Casterley Camp in Wiltshire. This hillfort (possibly late Bronze Age in origin) encloses an area of approx. 27.5 ha and is notable for the slightness of its banks, “in places no more than 1m high”. In order to further investigate the age and function of the Peasemore enclosure BARG has instigated a programme of fieldwork since 2003, the initial results of which are presented below. A survey was carried out to record the tree and shrub species in the surviving hedgerows (including a height and structure survey) and the evidence for ‘wood relic flora’ amongst the ground herbs in the hedgebanks. The results of the species survey carried out in 2003 can be found in the hedgerow section of the website, setting out the data which shows the hedges either side of the eastern lane are consistently rich in species. As predicted in that interim paper, however, the species richness of the hedges surrounding the enclosure may be linked to a potential origin as ‘wood relic hedges’. The record of ‘wood relic’ flora set out in fig. 3 shows that these plants were found to a greater or lesser extent in all the enclosure lane hedges. Dog’s mercury was particularly abundant on the western and southern sides of the enclosure, and bluebells were most noticeable along the southern side of Mud Lane. This may correspond with the record of former woodland shown on John Rocque’s 1761 map of Berkshire, where Prior’s Wood extended much further north, almost as far as Mud Lane. Finally it is also worth noting, given arguments presented later in this paper, that although the hedgerows marking out the fields inside the Peasemore enclosure have not been surveyed, they appear to be straight, thin hedges normally characteristic of late enclosure. In October 2003 BARG conducted a fieldwalking exercise in the eastern field of the Peasemore enclosure with members of the group and local volunteers helping to collect material. The field was walked using an 8% sample (except in the far east where a 4% sample was walked) consisting of 2m strips spaced 25m apart, with finds bagged every 25m along these strips. The overwhelming majority of finds from this exercise were worked flint, both tools and debitage. In total more than 2500 pieces of worked flint were collected, representing a very high density of finds. The flint has been analysed for typology and where possible date. Material appears to be present from the Neolithic and Bronze Age; maps of the finds will shortly be posted in the fieldwalking section. The distribution of finds shows varying degrees of concentration in the southern part of the field, which might be attributable, to some extent, to soilcreep down the slope which runs from NW to SE. Relatively little pottery was recovered from the fieldwalking, the majority being 18th or 19th century in date, with one sherd being possibly medieval. However other finds from gardens within the northern part of the enclosure and just to the north of the enclosure have produced pottery finds which appear to date from the Roman and medieval periods. Fieldwalking in the western part of the enclosure in 1977 and in other fields surrounding the enclosure have also produced Romano-British sherds, plus some medieval sherds and 1 sherd of Bronze Age pottery. CBM was also collected from the BARG fieldwalking exercise, and although yet to be analysed, the majority seems to have been found in the north eastern part of the eastern field. In 2005 BARG conducted a further fieldwalking exercise in a field to the south east of the enclosure (i.e. north west of Gidley Farm) in an attempt to see if a high concentration of flint artefacts continued beyond the enclosure. The results of this exercise are still being analysed. A geophysical survey was carried out in the paddock to the east of Widows farm within the enclosure using a RM4 twin probe resistivity meter and taking recordings at 0.5m intervals. The aim of this work was to look for any clear signs of past occupation or activity in an area of the enclosure now down to permanent grass. The resultant resistance plot (see the geophysics web page) does not show any clear features, although there is one noticeable area of higher resistivity towards the north of the paddock, in an area of the field that is slightly raised. Whilst it is not obvious what this feature is, John Rocque’s map of the Berkshire does show settlement extending further down this part of the enclosure. However, this may simply be an inaccuracy of an early map, and even if the area of high resistivity is a building, it appears as if the historic footprint of the village did not extend much further south eastwards based on the evidence of this plot. A further resistivity exercise was also carried out in the thin central pasture strip of the enclosure. Five transects were surveyed, the aim being to look for any evidence that the two roads which approach the enclosure from the east and west once continued on a path through what is now the enclosure rather than being ‘diverted’ around Mud Lane. In fact the resistivity survey (see geophysics page) produced no evidence for a former road in this area, suggesting that the pattern of lanes has always respected (or itself defined) the enclosure. BARG has made a start on surveying the oldest buildings in Peasemore, both for the intrinsic value of such a survey and to see if it offers any clues to the morphology of the village. The listing details for buildings in Peasemore seem to have been compiled from external surveys only, so there is a prospect that new information will be revealed.To date initial visits have been made to two buildings – one at the northern edge of the enclosure and one on the east side of the main north-south street. In both cases initial evidence from internal inspections appears to correspond with the dates suggested by the listing details. At this early stage in our research it is perhaps simply worth noting that the two oldest buildings in Peasemore, according to the listing details, are located at the edge of the Peasemore enclosure. Bearing in mind the above interim results of BARG fieldwork, and the doubts about whether the enclosure is a prehistoric monument, are there any alternative explanations for this curious pattern? One possible alternative can be found in the work presented in chapter 4 of Roberts and Wrathmell’s “Region and Place”, a nationwide study of rural settlement published by English Heritage in 2002. There the authors give numerous examples of core ‘arable ovals’ in dispersed settlement areas which have remained stable over long periods. These are typically associated with the primary settlement of a hall/church at the edge of the oval enclosure, with a few other farmsteads scattered around the edge. This sort of pattern can date from the Roman period, or perhaps even before, but in many cases is probably Anglo-Saxon or later. These arable ovals, which need not be perfectly oval, can range from 20 to 90 ha in size based on the examples supplied by Roberts and Wrathmell. Often the ovals are defined by surviving lanes or a ‘ring fence’ patterns of field boundaries. The ‘oval’ shape seems to derive from unhindered clearance of woodland or rough pasture for arable. When viewed against these examples from elsewhere in the country the situation of the Peasemore enclosure matches a number of the facets identified by Roberts and Wrathmell. Peasemore has evidence for significant former woodland in areas outside of the enclosure, in places abutting against it. In addition to the evidence of wood relic flora mentioned above, an analysis of the 1838 tithe award and map shows that significant sections of the parish are covered by fields bearing names related to former woods or heaths outside the enclosure area (see fig. 4). Figure 5 shows the pattern of modern tarmac roads in the vicinity of the Peasemore enclosure and the site of the church and oldest extant manor house in the village. The pattern of modern roads can of course sometimes be misleading, so fig. 6 also plots all those tracks, bridleways and footpaths shown on the 1838 tithe map. Fig. 6 also includes the record of settlement shown on the tithe map. It is clear that even when the wider network of tracks and paths is considered, the Peasemore enclosure was still a significant feature in the communications network rather than a quirk of those roads that have been surfaced with tarmac. In addition to the church and manor house, settlement also appears to have clustered around the edge of the enclosure, perhaps first consisting of dispersed farms, and later beginning to look more like a nucleated village (a process also attested by Roberts and Wrathmell at Whittlesford in Cambridgeshire and Stanfield in Norfolk). If the pattern displayed by Peasemore seems to have features in common with examples elsewhere in the country, can these characteristics be found in any of Peasemore’s neighbouring villages? Figures 7-10 show the communications network and 19th century settlement as shown on the 1st edition 6 inch OS maps for four neighbouring villages – Brightwalton, Chaddleworth, Chieveley and Leckhampstead. In each of these cases it is possible to identify areas, defined by modern lanes, which could themselves also be candidates for ‘arable ovals’ (again these need not be strictly oval in shape) with church, manor house, and other dwellings scattered around the edge. In the majority of cases these possible arable areas defined by surrounding lanes remained largely undivided by other tracks and paths. In the case of Chieveley the suggested ‘oval’ is recorded as a ‘common field’ on Rocque’s 1761 map, and much of the area, known as East Field, is allotted in the 1812 enclosure map for the parish. In Chaddleworth’s case the triangular shaped enclosure seems to have been enclosed before the parliamentary enclosure of 1813. In the cases of Chaddleworth, Brightwalton and Leckhampstead these parishes, like Peasemore, have significant place names indicating former woodland located outside the possible ‘arable areas’. It should be stressed that the tithe maps for these other four parishes have not been checked in drawing up this paper, nor has any fieldwork been conducted in these areas by BARG, so it is possible that former greens or areas of common pasture have been mistaken for former common arable areas. Nevertheless these tentative examples serve a purpose, to demonstrate that there is possibly a local pattern which the Peasemore enclosure could fit within, even if Peasemore remains the most clear cut example of a potential ‘core arable’ area. If the alternative theory for the Peasemore enclosure is accepted as a plausible hypothesis, what date might we ascribe to it? There may be one clue in the documentary records, which tell us that a church was built at Peasemore, probably on the site of the current church at the edge of the enclosure, sometime between 1078 and 1097. Thus it may be that the enclosure was in existence by this time, and the construction of the church may have acted as a stimulus for further settlement around the northern part of the enclosure, perhaps even helping to define the enclosure in this area. Clearly the question of the function and date of the enclosure cannot be settled without further fieldwork, and BARG plans a programme of resistivity and magnetomerty surveys, further fieldwalking and test pits within back gardens in order to discover more about the enclosure and its relationship with the settlement of Peasemore. Clearly however the enclosure has played a significant role in the morphology of the village and should be regarded as an important feature of village’s heritage, whether it proves to be a prehistoric cattle enclosure, a late Anglo-Saxon arable enclosure or something else altogether. The results presented in this paper are the product of fieldwork and research carried out by many BARG members too numerous to mention individually, but particular thanks ought to go to Don Lindsay for access to his documentary archive (including an annotated copy of the Peasemore tithe map) and to Graham Johnson for producing the graphs of flint distribution. The theories expounded here are of course, solely those of the author. West Berks SMR no. WB15808. The alleged ‘similar structure in the park at Lambourne (sic) Place’ has not been investigated as part of this paper. For example UffingtonCastle is just 3ha in area, Alfred’s Castle approx 1ha, Segsbury Camp 11ha. The only hillfort of comparable size to Peasemore (28ha) in Berkshire is Walbury Hill (the largest in Berkshire) at 31ha. See Lock, G, Gosden, C and Daly, P (2005) Segsbury Camp: Excavations in 1996 and 1997 at an Iron Age hillfort on the Oxfordshire (sic) Ridgeway, Oxford School of Archaeology Monograph no. 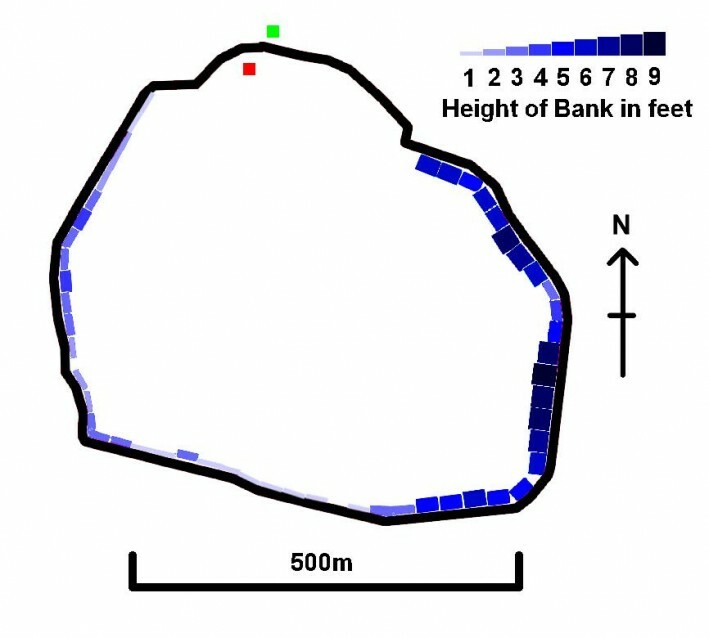 61, Oxford: 146 for a diagram comparing hillfort sizes. Area measurements in this paper have usually been calculated using the ‘area measure’ tool available with the interactive map at www.magic.gov.uk. Miles et al (2003) Uffington White Horse and its Landscape, Thames Valley Landscapes Monographs No. 18, Oxford Archaeology, Oxford: 118. The significant bank along the eastern side of the Peasemore enclosure might conceivably be explained by a combination of a ‘sunken lane’ effect and the build up of soil washed down the side of the dry valley. Brown, G, Field, D and McOmish, D (2002) The Field Archaeology of the Salisbury Plain Training Area, English Heritage, Swindon: 59, 76, 79. Casterley Camp differs from Peasemore however with the inclusion of very long straight sections of earthwork within its elongated circuit. The 2003 interim paper was written before the publication of the latest large scale regional hedgerow survey in Norfolk (Barnes, G and Williamson, T (2006) Hedgerow History: Ecology, History & Landscape Character, Windgather, Macclesfield) which has revealed serious doubts about the ability of hedgerow surveys to produce meaningful data on hedges older than c. 1750 and raised new questions about the application of wood relic flora. The Berkshire Hedgerow Survey conducted by BARG is expected to make a contribution to this debate on the application of hedgerow survey data. See SMR entries for details. Roberts, B.K and Wrathmell, S (2002) Region and Place: A Study of English Rural Settlement, English Heritage, London: 83-117. The sizes of these possible enclosures would be: Chaddleworth 13ha, Chieveley 37.6ha, Leckhampstead 27.4ha and Brightwalton 16.8ha. In Chaddleworth’s case the suggested ‘oval’ is in fact triangular in shape; an alternative much larger ‘oval’ for Chaddleworth could be postulated for the area to the south-west of this triangular loop, bounded by Botmoor Road and Sheephouse Road, with Poughley farm at the south-eastern extremity. This area was still open fields at the time of the enclosure map for Chaddleworth. Leckhampstead’s suggested ‘oval’ is in fact almost square in shape, but seems marginally preferable to the larger ‘oval’ demarked by the eastern side and the B4494 Wantage Road.